Also opting for a sari at the HT Most Stylish Awards was Dimple, who wore a pink sari with a matching blouse and a Jimmy Choo acrylic clutch. Back from London, Dimple was spotted at the airport wearing denims with a long sweater and grey tee. What caught my eye was the silver ankle bracelets. Now, between the taweez necklace, the Dior earrings, ring and the belt, all of it felt a bit overkill but I also liked it because it felt very her. She loves to over-accessorize and I like that. 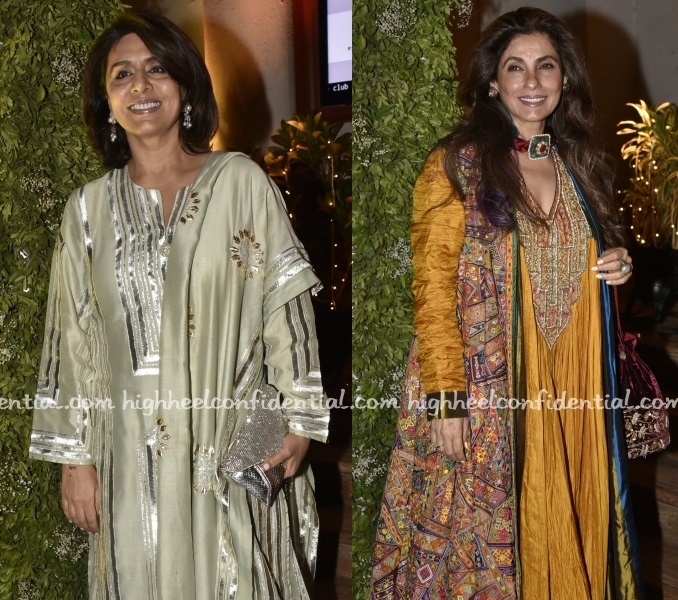 Neetu and Dimple attended Saudamini’s wedding reception with the former wearing a gota patti lehenga By Simar Duggal and the latter, an embroidered long kurta and mustard dress by Abu Jani Sandeep Khosla. 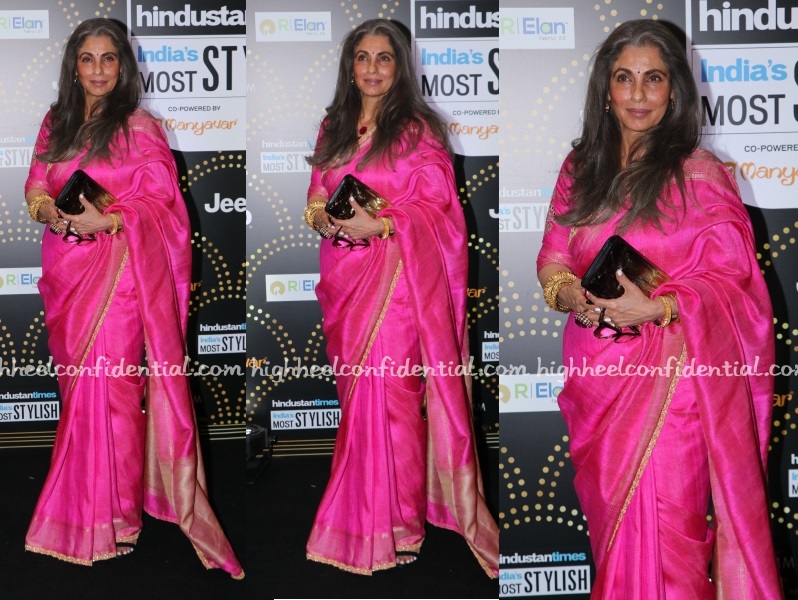 While Dimple looked nice, the mint color seemed to wash Neetu out a bit. P.S. 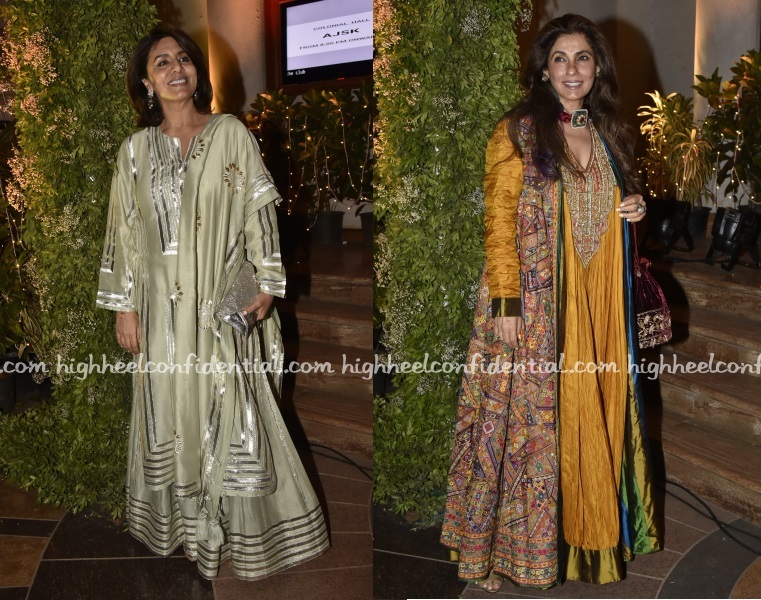 Saudamani is the CEO of Abu Jani Sandeep Khosla label and Sandeep Khosla’s niece. Dimple attended both the Beyond The Clouds screening and the Mijwan fashion show on Thursday evening wearing an Asal By Abu Sandeep suit to the former and a sari to the latter. She looked lovely in both! Dimple attended an art exhibition in Mumbai on Wednesday evening wearing a knit fitted skirt with a black turtleneck and a black long jacket. A long necklace and silver belt finished out her look. I think she could’ve gone either/or on the necklace/belt but boy, did she look fantastic!